The Bible provides several stories about Jesus In The Temple. It was His custom to go there on the Sabbath, and He also taught daily in the temple. 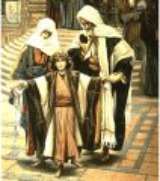 The gospel of Luke tells the story of the boy Jesus in the temple in Jerusalem. It was Passover, and as usual His parents went to Jerusalem to celebrate the feast. 41. Now his parents went to Jerusalem every year at the feast of the Passover. This story of Jesus in the temple happened when He was twelve. 42. And when he was twelve years old, they went up to Jerusalem after the custom of the feast. When it was time to leave Jerusalem, Jesus stayed behind in the temple, and His parents did not know where he was. 43. And when they had fulfilled the days, as they returned, the child Jesus tarried behind in Jerusalem; and Joseph and his mother knew not of it. 44. But they, supposing him to have been in the company, went a day's journey; and they sought him among their kinsfolk and acquaintance. 45. And when they found him not, they turned back again to Jerusalem, seeking him. 46. And it came to pass, that after three days they found him in the temple, sitting in the midst of the doctors, both hearing them, and asking them questions. It took Joseph and Mary 3 days to find Jesus in the temple. Jesus, as a child, astonished His parents and the educated adults with His knowledge. 47. And all that heard him were astonished at his understanding and answers. 48. And when they saw him, they were amazed: and his mother said unto him, Son, why hast thou thus dealt with us? behold, thy father and I have sought thee sorrowing. 49. And he said unto them, How is it that ye sought me? wist ye not that I must be about my Father's business? 50. And they understood not the saying which he spake unto them. This story of the man Jesus in the temple is about Him casting out those buying and selling in the temple. 16. And would not suffer that any man should carry any vessel through the temple. 17. And he taught, saying unto them, Is it not written, My house shall be called of all nations the house of prayer? but ye have made it a den of thieves. 18. And the scribes and chief priests heard it, and sought how they might destroy him: for they feared him, because all the people was astonished at his doctrine. This story of the man Jesus in the temple is also found in Matthew 21:12-16, and Luke 19:45-48. Click here to read about Jesus in the temple in Heaven. Click here to read more on the life of Jesus Christ and other bible topics.